Busy B Family: Snow, Snow, & More Snow!! Have I ever mentioned that I LOVE snow? It rained almost all day yesterday then it finally switched to snow around 6 last nite. Now, before we get to the winter wonderland pictures, I of course had to put some up of the most hansomest little almost 15 month old! These are the other pair of new shoes he got over the weekend and yes, he carries them around too! I took these this morning. Unlike the blizzard snow last week, this one basically fell straight down. There was no wind or anything, it was absolutely gorgeous! This tree is right in front of our dining room window and beside our driveway. It is my most favorite tree that I've ever laid eyes on. It stays the most beautiful green color ALL. YEAR. LONG! When I opened the curtain this morning... a huge limb had broke. The snow is so heavy, can you see how low the other limbs are hanging also? Poor tree. I was right in front of our house when I took this (side note: yes, I did stop when I took the pictures) as you go around the curve of our block there were 3 cars stuck! I felt so bad since I was in an suv, but honestly, I think I would have just made things worse. Not to mention, I didn't figure they would appreciate me taking their picture. This is our neighbor's across the street, their tree is bent to the ground! 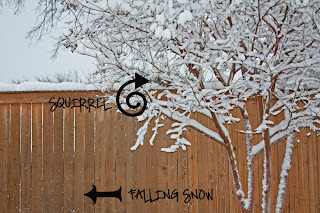 Or, the snow came up to the tree, ya know... however you see it! Wal-Mart lake. Isn't it pretty with all the fog? Fixing to turn on mom & dad's street. For some reason I just think the weighted down trees in town are to die for gorgeous! As I was putting Addison out to "potty" in the back yard, their neighborhood squirrel was running across the top of their fence. Of course by looking at this picture I know you can't see him, but I promise he's there! And you can see where he was kicking off the snow as he was going! And for the 3rd day in a row, when I got to work, Dad was out playing shoveling snow. He seems to be making a little progress! But secretly? I think he's just a little boy wanting to play in the snow! 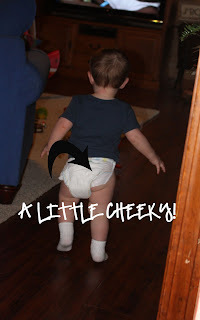 Landry's not going to like for his "cheeky" to be shown to everyone. Cute though. The snow is so pretty---want more? I don't know if the trees can take the pressure. I don't think Dad will ever grow up. Still a kid at heart.